I am sure that everyone has discovered that the switches in Dynamips and GNS3 do not have the capability of supporting complex switching labs, but all is not lost. High level switching can be accomplished by using a Cisco 3640 running c3640-jk9s-mz.124-16.bin IOS with an NM-16ESW installed in slot 1 as the high level switches. The Cisco NM-16ESW is a 16 port high density voice network module that provides layer 2 switching. It can be installed in the 2600, 3600 and 3700 series routers, and supports 10/100 on each of it 16 ports. This configuration can emulate most of the high level switch functions need to complete the CCNA, CCNP and most of the CCIE lab scenarios. The following a list of labs you can and cannot practice. 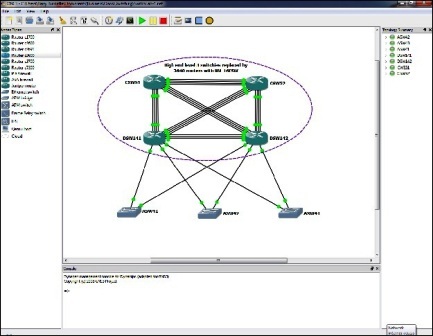 Intervlan Routing using Router on Stick or SVI. Port Security, Sticky Secure Mac Addresses. This is just some of the more popular command as you know there are many more but this give you an idea of how to configure the NM-16ESW for practicing switch lab scenarios. For more information about the Cisco NM-16ESW see the Cisco NM-16ESW documentation. Excellent work. You have gained a new reader. I hope you can keep up the good work and I await more of your excellent posts….